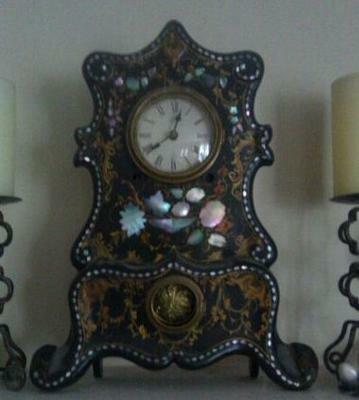 This clock belonged to my great grandmother's mother. She owned an antique store in Connecticut many years ago. I don't know much about her because my great grandfather married her daughter late in life. No one in that family is alive anymore. The clock had been in my great grandparent's house for about 15/20 years. When they both passed my mother was able to get it because she always admired it. She had it in her house for a few years, but was afraid of it. Everytime she touched it or moved it something bad would happen to her that day. And usually it involved her car. I've touched it numerous times, and nothing bad has happened to me, but I do feel like it is surrounded in bad energy. The clock is made by the Ansonia Clock Company. It is cast iron front with mother of pearl inlay, and hand painted gold designs. I've read that these were showcased at the first World's Fair in the 1950s. The clock doesn't work even though it's been fixed. It won't keep time, but I think it could be fixed again easily. The problem isn't mechanical at all I don't believe. I don't want to sell it because I love it. It's sitting on my mantle, and I admire it constantly. I also like how it's so mysterious. I've had some strange things happen to it or because of it, but nothing harmful.